Tracy Myers | Happy Father’s Day, Uncle Frank! Tracy Myers Home / Blog / Happy Father’s Day, Uncle Frank! Happy Father’s Day, Uncle Frank! At least once a day, someone comes up to me and asks, “So…how’s your Uncle?” Of course, they’re not asking about my REAL Uncle. They’re asking about the man that I’ve been referring to as “Uncle Frank” on television commercials over the past 20 years. That man is my father, Frank Myers. For the record, my father is alive and well. He’s doing what he loves doing most; being an entrepreneur. I’ve truly never met anyone that liked the “thrill of conquering” a business model quite like my father does. He’ll come up with a concept for a new business, brings it to life and makes it successful more times than not. Then he gets bored and moves on to the next challenge. For those of you that don’t know my “story”, I’d like to share it with you. Not because it’s that special but rather the misconceptions that revolve around it. Lots of folks assume that since my unofficial title is PHD (Papa Had a Dealership) and that I would have had an easy time getting into the used car business. Indeed, my father had big plans in store for me. Only they meant working 60 hour weeks in the detail shop! I was 15 years old when I first started working in my father’s detail shop and I hated it. It was brutally hot during the Summer months, bone achingly cold during the Winter ones and didn’t pay nearly enough. I decided early on that this was NOT the career path that I wanted to follow. So after graduating high school, I chose to go to college instead of going to work for my dad. So I would have some spending cash, I got a job as a salesperson at a local Toyota dealership. The schedule was brutal: I attended classes from 8am until 1pm and sold cars from 3pm until midnight. I loved selling cars so much. School? Not so much. So I decided to quit school after a few months and become a full-time car salesman. I did it without telling my parents. For some odd reason, my 20 year old brain didn’t think they would find out and I was pretty sure that my dad would have killed me if he knew that I was working for another car dealership other than his own. Of course, he DID know but never mentioned it. I give him props for allowing me the time and space to find my own way without stepping in. A couple of years later, I announced to him that I was coming home and would like to work for him at the dealership. He sounded happy and said he had a spot for me. So I turned in my notice at the Toyota store, headed home and showed up to work in a shirt and tie. My dad looked at me and told me I was a little overdressed. I was confused. Overdressed to sell cars? No way. The problem was I wasn’t going to be selling cars. I was going back to work in the detail shop. I stayed there for almost two years and I worked my way up the ladder through every aspect of the used motor vehicle industry. In 2006, at the age of 34, I bought the family car dealership and sold almost 1,400 vehicles in my first year. Fast forward to 2016 and I still love this business as much as I did the day I sold my first car. My Team is the best and they make me look much more talented than I actually am. The dealership has posted a 144% increase since 2008, has been named one of the fastest growing privately owned small businesses in America by INC magazine for 4 consecutive years (read about it HERE) and was named the #1 small business in NC by Business Leader Magazine (read about it HERE). A few years back, we were even fortunate enough to have had a documentary made about us. “Car Men” aired nationally on the Biography channel, won several Telly awards and was even nominated for an Emmy! You can watch it HERE. My dad is still my biggest supporter as well as my biggest critic. Regardless of our differences, there is one thing we can both agree on that took us way too long to realize. If we put God and family before the dealership, then the dealership will always prosper with a lot of sweat equity and prayer. 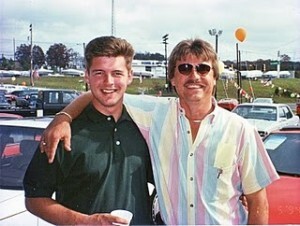 Happy Father’s Day to the best dad in the world and the best “car guy” that I’ve ever met…Uncle Frank! PS: The photo above is of me (on the left) and my dad (on the right) in 1994 the day after I had sold my first car at the dealership. This is one of my favorite pictures of me and my dad. Uncle Frank’s 21 Secrets of Creating a Money-Making Customer Experience REVEALED!